This intimate and inviting restaurant has become the eating place of preference in the area. 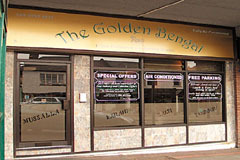 With an insistence on maintaining very high standards of quality of food and service, the restaurant has established a reputation which is second to none. The menu includes the most popular traditional dishes plus many house specialities which reflect the long experience of the chef in authentic home-style cooking. The lunch menu and the “earlybird” menu (5.30-7pm) offers 20% discount off your food bill – superrb value. Open every day 12-2pm and 5.30-11pm (last orders). All major credit cards accepted (not Diners). No service charge.